High capacity to prevent clogging and flooding! Sani-Floor’s Clog-Free™ Strainer Technology Floor Troughs are uniquely designed to provide superior straining capacity of food debris. Ordinary floor trough designs only have one 6″ diameter strainer basket. 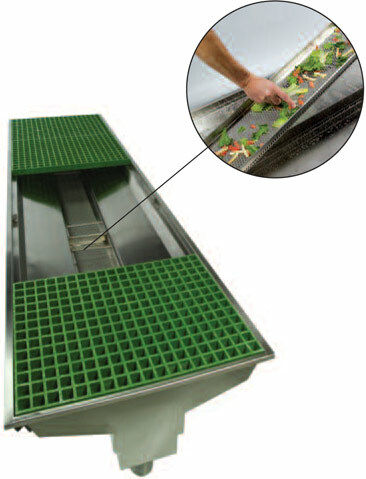 Sani-Floor’s high capacity strainer tray runs continuously through the bottom of the trough. Water from food waste and surrounding areas percolates through the strainers, eliminating dams and strainer clogs, and allows drain water to flow freely to the building drain. Our strainer trays catch food solids and particulate matter as small as a grain of rice.